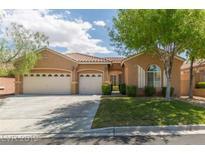 Below you can view all the homes for sale in the Park Paseo Southern Highlands subdivision located in Las Vegas Nevada. Listings in Park Paseo Southern Highlands are updated daily from data we receive from the Las Vegas multiple listing service. To learn more about any of these homes or to receive custom notifications when a new property is listed for sale in Park Paseo Southern Highlands, give us a call at 702-323-5933. 2018 Renovation and remodel, updated den and master bedroom including beautiful modern flooring. MLS#2089126. Realty ONE Group, Inc.
Dog run on side of house. **Washer/Dryer and Fridge included. MLS#2081514. Realty ONE Group, Inc.
Large Master Bedroom with bay window. New carpet & vinyl. Fresh paint. MLS#2079928. PropertyMax Group LLC.